We have a winner! Well, three! A huge big thank you to all of you lovely lovely people for entering my giveaway! The lucky winners have been chosen via Random.org random number generator. I entered numbers from 1 to 74 (74 entries were received) and then asked random.org to generate me three winners (with the first, earliest email sent being number 1, and the final, most recent email being number 74). I’ve done this totally randomly and honestly, choosing just three numbers and triple checking the numbers of each email. Jess Hutchinson and Lorraine Murphy! Well done Kym! I will fire you over an email tonight and we will get the ball rolling to have your owl designed and cut in January! For those of you who weren’t lucky enough to win tonight, I will be running a special offer in January, offering a limited number of slots for bespoke personalised owls available at the special price of £25 (rather than £30) – this is for an A4 owl inc P&P. Details will be up on my page soon. Also keep your eye out for new product lines and designs launching next year – I’ve got great things planned for Holmes-made in 2013! Thank you once again to all of you for taking the time to enter, and for supporting my page. It’s gone from strength to strength this year and I’ve got you lot to thank for it… You make me feel all warm and fuzzy! All that remains is for me to wish you an utterly fabulous Christmas/cool Yule – may it be filled with fun times, delicious food and fantastic company. Here’s to a happy, healthy 2013… And perhaps another giveaway soon! 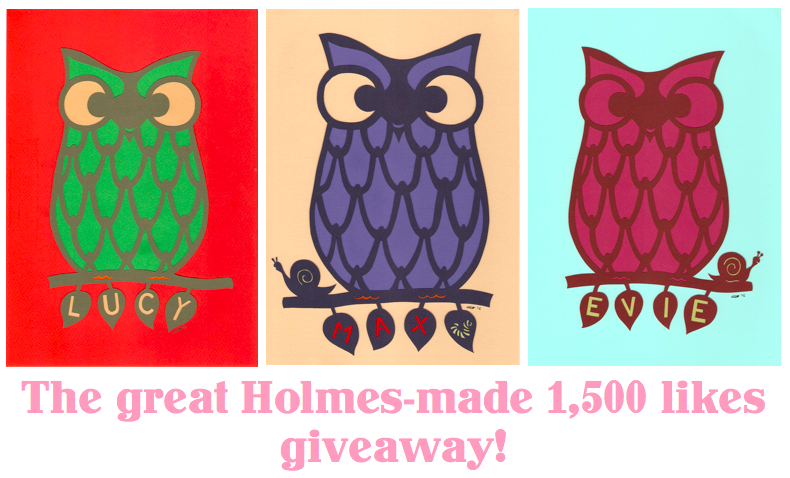 The great Holmes-made 1,500 likes giveaway! Hello! You’ve probably found this blog because you’re a fan of my page on Facebook, where you can find all sorts of bespoke, hand-drawn and hand-cut papercut loveliness. One lucky Holmes-made fan could win a unique, personalised papercut owl featuring the colours and fabrics of their choice, which will be cut and delivered in the new year. Two lucky runners up will each bag themselves a multipack of my printed Christmas cards (three cards, one of each festive design – for more info see http://www.folksy.com/shops/HolmesMadeCrafts). The runner-up prizes will be delivered before Christmas (all being well with Royal Mail!). Entering is easy. For your chance to win, all you have to do is send me an email to holmesmadecomps @ gmail.com (without the spaces) with the title “Christmas comp” in the subject line. Heck, you can even write me a message if you like, but all I need is the email – that’s it. Couldn’t be simpler!! Emails must be received by 7pm on Tuesday 18th December, and I will announce the winners that night. Winners will be notified via email with a little nod on my FaceBook page, since FB rules don’t allow me to state winners on my page! The winners will be chosen using a random number generator (each email will be numbered and winners will be selected that way). Erm, I think that’s everything, although I think I’m meant to say that this giveaway is in no way endorsed by or associated with Facebook at all, in any way possible. Ever. So, if you fancy providing a home to a little feathered friend in the New Year, drop me an email and enter NOW! 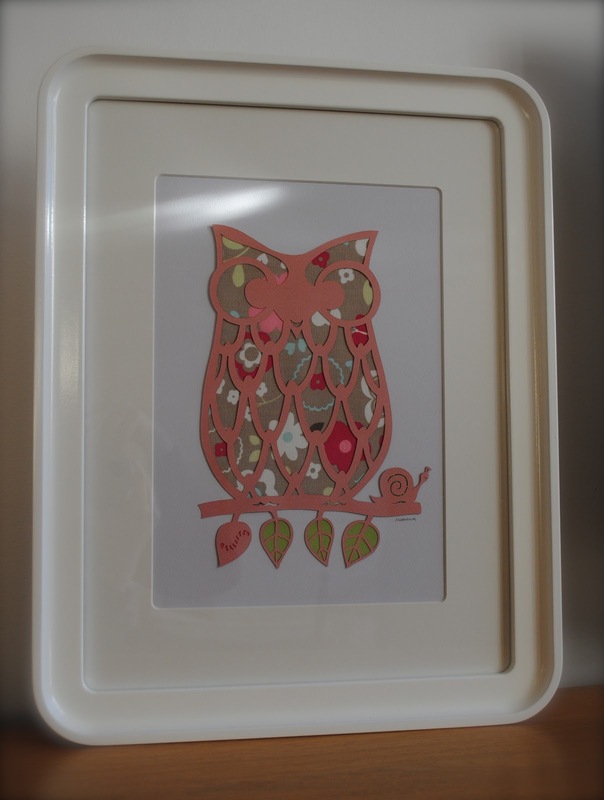 The main prize is an A4, unframed papercut owl, featuring a personalised name in the leaves. The winner gets their choice of paper colours, fabric and glittery bits, to be organised in consultation with me in the new year. Prize will be posted out in the new year (mid-January at the latest). Two runners up will each receive a multipack of Holmes-made Christmas cards; a three-pack featuring one of each design. You can either give them away this year or keep them till next! These will be posted before the last first class posting date (20th December). Competition entries must be sent to holmesmadecomps @ gmail.com (no spaces) and received by 7pm on Tuesday 18th December. Any entries received after this time will not be included in the draw. I will draw the competition and let the winners know via email and via an announcement on this blog on the same night. The main prize is an A4, unframed papercut owl, featuring ONE personalised name in the leaves. The winner gets their choice of paper colours, fabric and glittery bits, to be organised in consultation with me in the new year. Prize will be posted out in the new year (mid-January at the latest). Entries from the UK only please people – although I’m feeling generous, I’m only going to cover UK postage.